At Woking in Surrey near the Church. A New built brick House, sash’d, four Rooms on a Floor, good Garrets, a very good Garden wall’d in, well planted with the best Fruit Trees now in perfection, a very good Summer- house, Stabling for three Horses, with or without ten Acres of Meadow Land in Closes; a navigable River comes to the Town, and a Stage Coach comes within a Mile and a half; four Miles from Guildford, five from Chertsey. Enquire for further Particulars of Mr. Matthew East, Distiller, the corner of St. Bride’s-Alley in Fleet Street; and of Mr George Harvest, brewer, in Woking, or of Mr. Abraham Harvest, brewer, in Old Brentford. William Grove appears as the occupant in the Land Tax return of 1812 and in later years. Arthur Locke says Mr Bensley, a London publisher, opened a printing works in Church Street. Alan Crosby confirms a printing business was established there in 1837 opposite St Peter’s church and transferred to Guildford in 1856. 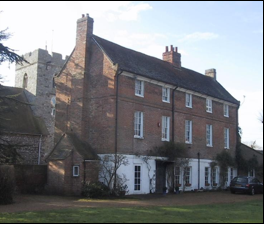 Although both Weylea and Church Cottage were occupied by Benjamin Bensley, the printing business was not conducted from these premises but from a site opposite to St Peter’s roughly in the area subsequently occupied by the village school now the Church Centre. Joseph Billing, a subsequent owner of the business, is shown in nearby Shackleford in the 1851 Census. RH Seddon, assistant master in school, Edith Kingsley retired hospital nurse and housekeeper, Janette Smith widow and retired housekeeper and Frederick Pope domestic gardener. The regulations go on to say All boys who desire it, can have gardens in the High House garden. They are under a high south wall and quite sheltered from the north and east winds. These gardens are very popular in the spring and summer months.